Just when you think you’ve got the hang of riding on the top of the world, it pisses down with rain. I mean rain that goes on for eight hours non-stop. My gear stood up to the elements for about four hours then it gave up the ghost. Even the waterproof boots decided to call it a day. While I don’t mind riding in the rain, I have to say this downpour really was pushing the envelope when the electrics kept dying. Each time the magneto got covered in water the engine would miss, which meant having to roll the bike down to the bottom of the hill and start again. I passed eighteen crashed vehicles in one day – that’s got to be some kind of record. By the time I limped into Pokhara I was done but a really hot shower made all the difference. The thermal underwear was great – just hope all the rest of my kit can dry out in time for the next leg. I’ve been on the road less than a week and already I’ve had to put another notch in my belt as I’m losing weight at a great rate of knots with all the exercise. The scenery in places was amazing but could only take photos here and there -too risky otherwise. Had a good day’s rest in Pokhara and gave the bike a real clean. 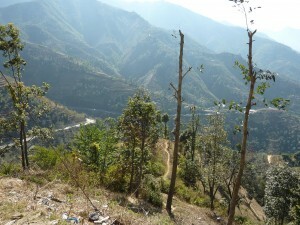 Ride from Pokhara to Butwal near the border was a blast…well most of it. Twenty hills (really mountains) to climb but FN doing brilliantly. Only one stumped us. I paid a passerby to help push the bike the final 20 metres to the top – money definitely well spent! Had a close call with a convoy of trucks when one decided to reverse and we only missed having a collision when the passenger jumped out and saw me. Accommodation last night fair – much as I expected. A nice homestay in Agra is sounding pretty good right now! I’ve had to put another notch in my belt as I’m losing weight at a great rate of knots – must be all this bloody pedalling. The land has flattened out now so it should be easier going roadwise, but I know the traffic from here to Agra is bound to see me sweat a few more kilos! About to do my first border crossing today. I remember them as being pretty stressful in South America but from what I’ve read they’re pretty cool here. Once across I’ll be heading to Gorahkpur – a total of 167 kms for today. Doesn’t sound like much, but if the traffic’s all it’s cracked up to be I should make I by nightfall! Anyway, it’s goodbye from him (Nepal) and goodbye from me…The Old Bloke. Shower caps are meant to be effective at keeping water out of magnetos, I’ve seen them used on Brough Superiors, the owners of which vouch for the effectiveness. Thanks for sharing in the experience. I’ve just remembered the other trick I’ve heard of, used mainly by Land-Rover owners. A washing up glove with a hole in the end of each finger for the HT leads. Great idea Mathew! I’ll certainly keep that one in mind for the next time I see rain. Not sure anyone in India uses washing up gloves – LOL, but a surgical glove might even do the trick. The start to your trip sounds like the early days of my motocross racing. So much to do the night before. :-). You’ll get what I mean. Being prepared. ;-). We are so envious, jealous, and so proud of you living your dream. It sounds as though you’ll have to start eating lard just to keep some weight on you. We are all watching. Happy travels and stay in touch. Your family loves you. As a fellow FN four owner, I am speach-less over your adventure. My 1910 single speeder would cruise ar 30 plus on the flat, but was useless on the hills. I now have a ’12 with a two speed box and a very rare OHC conversion, which makes the intakes mechanically operated. I use a 1000cc Zenith Gradua on most veteran runs. If you survive, I will look forward to mechanical advice on FNs. Take your time for your trip to Europe, because we all are waiting to give you and your FN 4 (with our FN motorcycles) a very heavy welcome at the 10the FN motorcycle meeting in Bernkastel-kues in September this year. Also we put your “Blog” to some oldtimers motorcycle forums in Europe (www.motoclub.de)and there will be several articles in Oldtimer magazines about your trip with the FN four to there. Hey Jacques my old mate. Sounds like we’re going to be doing some celebrating when I reach Bernkastel-Kues in September. Still waiting for my Iranian visa to be approved and hope to pick it up in Pakistan. Meanwhile I’m taking a few days to recover from the past two weeks which have been pretty full on. The articles & forums sound great – hope everyone enjoys reading about the journey. Great to read your post. I had the same problem as you with lack of power until increased the holes in the exhaust baffle to let it breathe better and also I found the secret was in the inlet valve springs which must just lift one mm off the seat with 200g on the stem of the valve. Happy to help with any FN advice if i can. i would really like to see a picture of the OHC conversion as I’ve heard of them but never seen one. I plan on surviving the trip for sure. I might even get to travel back through the US on my way home – we’ll see if my rear end can hold up. Thanks for your good wishes and enjoy the ride with me!